Leave No Trace and Roma are in common between the two. I think Wilkins watched Leave No Trace and said it was super boring, even tho it was the 2nd highest rated movie of the year. I also thought about it over break and moved Spider-Verse to my #1. As we've debated before "favorite" and "best" are not the same. BlackKklansman was probably a better movie and certainly more important, but Spider-Verse was just so fun. If I had to rewatch any movie on the list right now it would be that one. Been a while since I've updated anything, mostly because I don't go to movies anymore. I think this is up to date now. 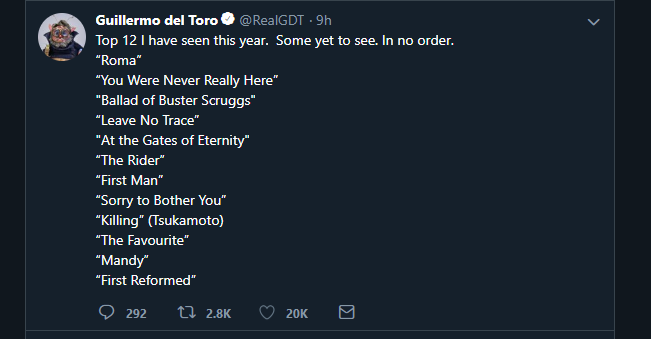 58 total, granted I watched some of these in 2019. It sure didn't feel like I was watching at least 1 movie a week. Some months it felt like I didn't see any at home or in theaters. Added Overlord above. I still want to see a few Oscar noms from 2018, but idk when that will happen. Jocelyn is watching A Star is Born right now without me.